Gurjot Singh Bhatti – Never Back Down! So last month I participated in a 48-hour game jam in my University. I was in a team of 5 people. The theme of the game jam was “You are villain”. We discussed about the theme and decided that we should make it simple yet fun. We wanted to create something that everyone can relate with. And what better game than the classic Pacman. We thought let us give our players the ability to control the ghosts. It sounded nice but how to go about it? Which ghost should we let the player control? Instead of picking one of the ghosts we picked all. Yes, you read that right all of the ghosts could be controlled by the player. But now it begs the question of how to control all of them? Let the user switch between them through buttons? That was one solution but we went nuts and let the player control all the ghosts simultaneously. Yep, we were going to let the player manipulate all the ghosts from a single controller. We used Xbox controller and use left thumbstick, right thumbstick, directional pad and 4-buttons(A, X, B, Y) to control the ghosts. And another controller to control the player. So essential we made it a 2-player game with one person controlling the pacman and the second person controlling all 4 ghosts. We were sure that people were going to go crazy figuring out the controls of the game. Since Halloween was approaching we opted to give our game a thematic look. I created a pixel art characters as you can see below. 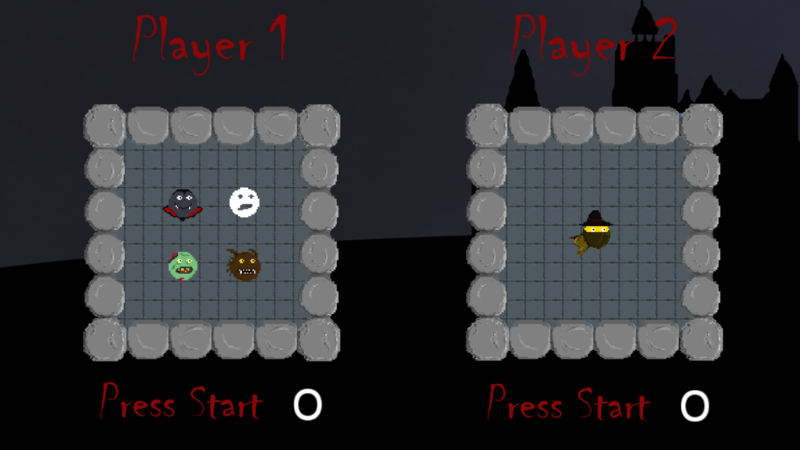 We made our pacman Van Helsing lookalike, hence PacVan (our title for the game). Our 4 ghosts were Werewolf, Zombie, Dracula and Ghost (yeah.. simple one). Each of us designed one level, so in total we got 5 playable levels. The current game is simple and you can get it from here and play. There are many features like Portal travel, Selective passing, Hide behind Grass, Time trial, etc. We have loads of ideas that can be incorporated in the game and we may implement them in the game some other time. We got many compliments from players who played the game. It was pretty fun to watch them figuring out the controls and miss the PacVan by moving the wrong ghost. In conclusion, people who were playing as ghosts won more times than people who played PacVan, despite the obvious fumbling with controls. It was a great experience for me and I’d love to be part of such events in future as well.